When it comes to ranking popular frozen desserts, most people would agree that frozen yogurt is healthier than ice cream. Here's a simple homemade version that trumps them both. 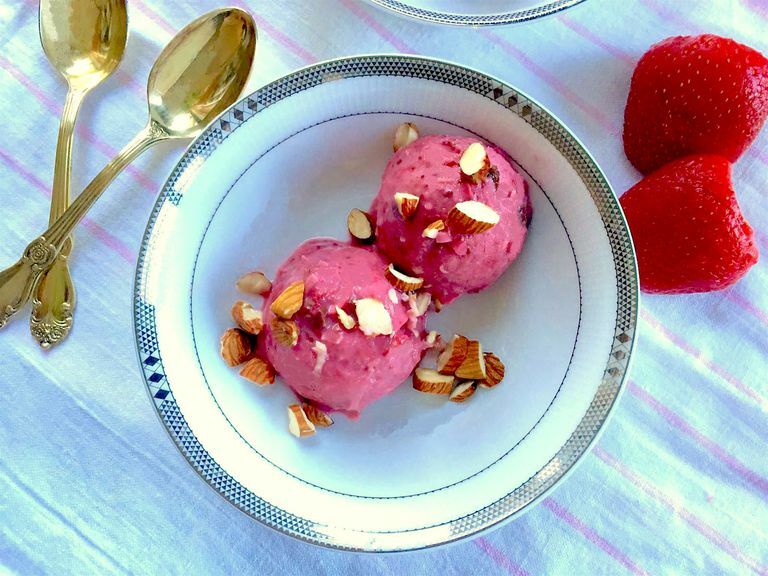 Compared to ice cream, frozen yogurt contains a few grams less fat per serving, particularly saturated fat, which is important to limit for optimal heart health. When you look at the bigger picture though, between added sugar and toppings, the favorite dessert may not be so healthy after all. This DIY version is quick and easy (plus much, much cheaper). You get a bit of filling protein from the Greek yogurt and a small dose of heart-healthy omega-3s from the flaxseed. Even the flavanols from the dark chocolate chips offer cardiovascular benefits, like improving the state of platelets and reducing blood pressure. 1. Blend the Greek yogurt, flaxseed, frozen strawberries, lemon juice, jam, and water. The resulting texture should be thick but smooth. 2. Transfer the blended mixture to a bowl and gently stir in the coconut flakes and dark chocolate chips. 3. You can serve immediately or freeze for 15 minutes to half an hour to allow the frozen yogurt to firm up. Top with chopped almonds before serving. Store leftovers in the freezer and allow to thaw slightly before enjoying. Don't be afraid to use full-fat Greek yogurt if you'd like a creamier product. You're only using 1/4 cup for the entire recipe, so the difference in fat per serving won't be too significant but will be more satisfying. Experiment with fruity flavors. While the strawberries contribute to the sweet and tart flavor characteristic of frozen yogurt, other options like blueberries, mango, and even banana would be tasty, too. The key is to make sure they're well frozen. You can omit the jam if you're using the sweeter fruit. You can also switch up your toppings. All nuts provide filling fiber, beneficial heart-healthy fats, and a satisfying crunch, so use your favorite. Regardless of the fruit you're using, make sure that it's frozen well. Otherwise you'll be left with a runny, unappetizing texture. You can cut up fresh fruit and freeze it yourself, or buy the frozen packs—they're useful when the fruit isn't in season or if you're just in a hurry. Having the fruit sliced up into smaller chunks helps blend more smoothly, so if you can, let the frozen fruit slightly thaw and roughly cut it up before continuing to freeze.